[S720] Dorothy Colburn, comp., Old Drawyers: The First Presbyterian Church in St. George's Hundred (Odessa, Del. : n.pub., 1989), p. 201 (naming James B. Naudain as her father). [S1] Ruth Bennett, Naudain Family of Delaware (Geneva, Neb. : n.pub., 1941), pp. 93-94 (naming James Blackston Naudain as her father). This material is a typescript of "notes" in Ms. Bennett's possession and apparently was originally written and compiled by James W. Lattomus. Copies are with the D.A.R. Library, Washington, D.C., and Roger Bartlett, Austin, Tex., and can be viewed at http://www.rabgenealogy.com/ui53.htm. The notes contain some inconsistencies, and page 45 was missing from the D.A.R. Library copy when it was copied. [S961] Find A Grave, online at http://www.findagrave.com, memorial for viewed on 3 Apr 2010 (James B. Naudain, memorial no. 5086675) (naming Lydia Naudain as his daughter). [S961] Find A Grave, online, above, memorial for viewed on 3 Apr 2010 (Lydia E. Naudain, memorial no. 5086677). [S720] Dorothy Colburn, comp., Old Drawyers: The First Presbyterian Church in St. George's Hundred, above, p. 201 (giving only the year and not giving the place). [S961] Find A Grave, online, above, memorial for viewed on 3 Apr 2010 (Lydia E. Naudain, memorial no. 5086677) (giving the date but not the place). [S961] Find A Grave, online, above, memorial for viewed on 1 May 2004 (grave of Lydia E. Naudain) (giving 20 Aug 1887 as her death date). [S720] Dorothy Colburn, comp., Old Drawyers: The First Presbyterian Church in St. George's Hundred, above, p. 201 (giving 1887 as her death date). [S1] Ruth Bennett, Naudain Family of Delaware, above, p. 94 (stating that she died while visiting her aunt, Mrs. Robert A. Cochran, in Mt. Airy, Delaware). [S1] Ruth Bennett, Naudain Family of Delaware (Geneva, Neb. : n.pub., 1941), p. 94 (naming William Robert Cochran as his father). This material is a typescript of "notes" in Ms. Bennett's possession and apparently was originally written and compiled by James W. Lattomus. Copies are with the D.A.R. Library, Washington, D.C., and Roger Bartlett, Austin, Tex., and can be viewed at http://www.rabgenealogy.com/ui53.htm. The notes contain some inconsistencies, and page 45 was missing from the D.A.R. Library copy when it was copied. Eliza Polk Cochran's tombstone, Forest Presbyterian Church Cemetery, Middletown, Del., courtesy of James Ethridge. Other Names*: Eliza Cochran, Elizabeth Polk Cochran, Elizabeth Cochran. • History of, and information about, the training school in Elwyn, Pennsylvania, is here. [S1] Ruth Bennett, Naudain Family of Delaware (Geneva, Neb. : n.pub., 1941), p. 94 (naming William Robert Cochran as her father). This material is a typescript of "notes" in Ms. Bennett's possession and apparently was originally written and compiled by James W. Lattomus. Copies are with the D.A.R. Library, Washington, D.C., and Roger Bartlett, Austin, Tex., and can be viewed at http://www.rabgenealogy.com/ui53.htm. The notes contain some inconsistencies, and page 45 was missing from the D.A.R. Library copy when it was copied. [S1448] Journal-Every Evening, Wilmington, Del., above, 7 Oct 1953, p. 16, col. 8 (obituary for Miss E. P. Cochran) (naming Annie Naudain Cochran as her mother). [S1448] Journal-Every Evening, Wilmington, Del., above, 7 Oct 1953, p. 16, col. 8 (obituary for Miss E. P. Cochran) (naming the place but not giving the date). [S961] Find A Grave, online at http://www.findagrave.com, memorial for Eliza Polk Cochran, memorial no. 7753349, viewed on 21 Jul 2018 (giving the date but not the place). [S1448] Journal-Every Evening, Wilmington, Del., above, 7 Oct 1953, p. 16, col. 8 (obituary for Miss E. P. Cochran) (stating that she died that afternoon). [S1448] Journal-Every Evening, Wilmington, Del., above, 7 Oct 1953, p. 16, col. 8 (obituary for Miss E. P. Cochran). Herman Cochran's tombstone, Forest Presbyterian Church Cemetery, Middletown, Del., courtesy of James Ethridge. Note*: • His obituary says he was born on 10 Jan 1873 near Middletown, Delaware, but a family history gives the date as a year earlier, 10 Jan 1872, and does not mention a place. • He was educated at Friends School in Wilmington, Delaware and Shortlidge Academy in Media, Pennsylvania. • In World War I, he was connected with what then was the U.S. Shipping Board Bureau (and evolved into the Maritime Commission) and was active in the Hog Island shipbuilding project. For some years he was associated with the Phoenix Bridge Company and then was in the insurance business in Chicago and Boston, retiring about ten years before his death. • Hog Island, including the World War I shipyard project, is discussed in a Wikipedia article here. [S1441] Wilmington Morning News, Wilmington, Del., online at http://www.newspapers.com, 30 Mar, 1951, p. 4, cols. 6-7 (obituary for Herman Cochran). [S961] Find A Grave, online at http://www.findagrave.com, memorial for Herman Cochran, memorial no. 120351843, viewed on 20 Jul 2018 (giving the year but no other information). [S961] Find A Grave, online, above, memorial for Herman Cochran, memorial no. 120351843, viewed on 20 Jul 2018 (supposition to their marriage based on picture of joint tombstone naming Herman Cochran and M. Lionne Beaston; not giving a date). [S1441] Wilmington Morning News, Wilmington, Del., above, 30 Mar, 1951, p. 4, cols. 6-7 (obituary for Herman Cochran) (stating that he died early that day). [S1441] Wilmington Morning News, Wilmington, Del., above, 30 Mar, 1951, p. 4, cols. 6-7 (obituary for Herman Cochran) (stating that interment would be in Forest Cemetery). [S961] Find A Grave, online, above, memorial for Herman Cochran, memorial no. 120351843, viewed on 20 Jul 2018 (not giving the date). [S1441] Wilmington Morning News, Wilmington, Del., above, 30 Mar, 1951, p. 4, cols. 6-7 (obituary for Herman Cochran) (stating that hd was born on 10 Jan 1873 near Middletown, Delaware) (first bullet). [S1] Ruth Bennett, Naudain Family of Delaware, above, p. 94 (stating that he was born on 10 Jan 1872) (first bullet). [S1441] Wilmington Morning News, Wilmington, Del., above, 30 Mar, 1951, p. 4, cols. 6-7 (obituary for Herman Cochran) (second bullet). [S1441] Wilmington Morning News, Wilmington, Del., above, 30 Mar, 1951, p. 4, cols. 6-7 (obituary for Herman Cochran) (third bullet). This obituary says that these events happened in World War II, but it must have been World War I, as (according to Wikipedia) the Maritime Commission was created in 1936 and the Hog Island shipyard project was a World War I project that had been replaced by Philadelphia International Airport by World War II. [S1] Ruth Bennett, Naudain Family of Delaware, above, p. 94 (giving 28 Apr 1921 as their marriage date) (fourth bullet). [S1441] Wilmington Morning News, Wilmington, Del., above, 30 Mar, 1951, p. 4, cols. 6-7 (obituary for Herman Cochran) (stating that they married in 1914) (fourth bullet). M. Lionne Beaston's tombstone, Forest Presbyterian Church Cemetery, Middletown, Del., courtesy of James Ethridge. Other Names*: Mary Beaston, Mary Lionne Beaston Cochran, Mary Beaston Cochran, Mary Louise Cochran, Mary Cochran, Mary Beasten, Mary Lionne Beasten Cochran, Mary Beasten Cochran. [S961] Find A Grave, online at http://www.findagrave.com, memorial for Herman Cochran, memorial no. 120351843, viewed on 20 Jul 2018 (based on picture of joint tombstone naming him and M. Lionne Beaston). [S1] Ruth Bennett, Naudain Family of Delaware (Geneva, Neb. : n.pub., 1941), p. 94. This material is a typescript of "notes" in Ms. Bennett's possession and apparently was originally written and compiled by James W. Lattomus. Copies are with the D.A.R. Library, Washington, D.C., and Roger Bartlett, Austin, Tex., and can be viewed at http://www.rabgenealogy.com/ui53.htm. The notes contain some inconsistencies, and page 45 was missing from the D.A.R. Library copy when it was copied. [S961] Find A Grave, online, above, memorial for Herman Cochran, memorial no. 120351843, viewed on 20 Jul 2018 (based on picture of joint tombstone naming him and M. Lionne Beaston) (giving the year but no other information). [S1448] Journal-Every Evening, Wilmington, Del., online at http://www.newspapers.com, 26 Aug 1953, p. 31, col. 6 (obituary of Mrs. Lionne B. Cochran) (stating that she died in the afternoon and that death was due to a heart condition). [S1448] Journal-Every Evening, Wilmington, Del., above, 26 Aug 1953, p. 31, col. 6 (obituary of Mrs. Lionne B. Cochran) (identifying the cemetery as Forest Cemetery). [S1] Ruth Bennett, Naudain Family of Delaware, above, p. 94 (giving 28 Apr 1921 as their marriage date). [S1441] Wilmington Morning News, Wilmington, Del., online at http://www.newspapers.com, 30 Mar, 1951, p. 4, cols. 6-7 (obituary for Herman Cochran) (stating that they married in 1914). Gov. John Price Cochran Sr.
Gov. 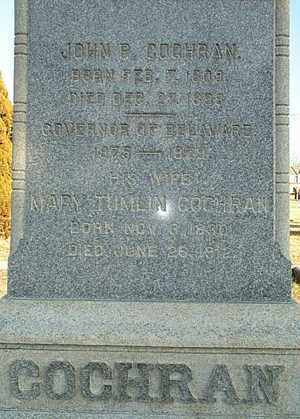 John P. and Mary Tumlin Cochran's tombstone, Forest Cemetery, Middletown, Del. [S1099] Wikipedia Online Encyclopedia http://en.wikipedia.org/wiki/Main_Page, s.v. "John P. Cochran," viewed 30 Jul 2006. [S1148] Ruth Stonesifer, Delaware Family Genealogies, online http://rstonesifer.com/genealogy.htm, viewed 3 Sep 2007 (image of grave marker) (giving the date but not the place). [S1099] Wikipedia Online Encyclopedia, above, s.v. "John P. Cochran," viewed 30 Jul 2006 (giving her name as Elizabeth Polk). 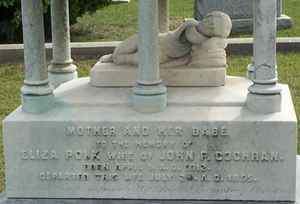 [S1148] Ruth Stonesifer, Delaware Family Genealogies, online, above, viewed 3 Sep 2007 (image of common grave marker stating that she was the wife of John P. Cochran) (not giving the date). [S1148] Ruth Stonesifer, Delaware Family Genealogies, online, above, viewed 3 Sep 2007 (image of common grave marker stating that she was the wife of Gov. John P. Cochran). [S1099] Wikipedia Online Encyclopedia, above, s.v. "John P. Cochran," viewed 30 Jul 2006 (naming John P. Cochran as his father). [S1148] Ruth Stonesifer, Delaware Family Genealogies, online, above, viewed 3 Sep 2007 (image of grave marker indicating Eliza Polk Cochran was his mother). 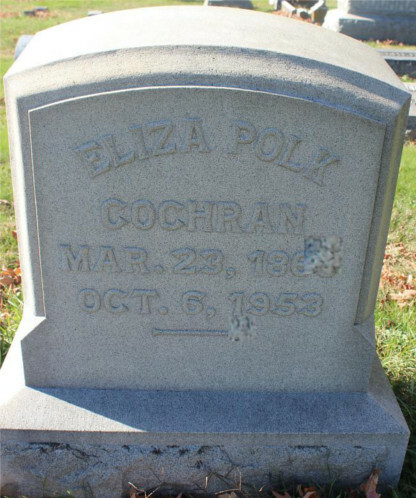 Eliza Polk Cochran's tombstone, Forest Cemetery, Middletown, Del. Other Names*: Eliza Poli Cochran, Eliza Cochran. [S1148] Ruth Stonesifer, Delaware Family Genealogies, online http://rstonesifer.com/genealogy.htm, viewed 3 Sep 2007 (image of grave marker). [S1099] Wikipedia Online Encyclopedia http://en.wikipedia.org/wiki/Main_Page, s.v. "John P. Cochran," viewed 30 Jul 2006 (giving her name as Elizabeth Polk). [S1099] Wikipedia Online Encyclopedia, above, s.v. "John P. Cochran," viewed 30 Jul 2006 (giving only the year and giving her name as Elizabeth Polk). [S1] Ruth Bennett, Naudain Family of Delaware (Geneva, Neb. : n.pub., 1941), p. 94 (naming Eliza Poli as his mother). This material is a typescript of "notes" in Ms. Bennett's possession and apparently was originally written and compiled by James W. Lattomus. Copies are with the D.A.R. Library, Washington, D.C., and Roger Bartlett, Austin, Tex., and can be viewed at http://www.rabgenealogy.com/ui53.htm. The notes contain some inconsistencies, and page 45 was missing from the D.A.R. Library copy when it was copied. [S961] Find A Grave, online at http://www.findagrave.com, memorial for William R. Cochran, memorial no. 7753324, viewed on 20 Jul 2016 (naming Eliza Polk as his mother). [S1] Ruth Bennett, Naudain Family of Delaware (Geneva, Neb. : n.pub., 1941), p. 94 (naming Myers Clark Conwell as his father). This material is a typescript of "notes" in Ms. Bennett's possession and apparently was originally written and compiled by James W. Lattomus. Copies are with the D.A.R. Library, Washington, D.C., and Roger Bartlett, Austin, Tex., and can be viewed at http://www.rabgenealogy.com/ui53.htm. The notes contain some inconsistencies, and page 45 was missing from the D.A.R. Library copy when it was copied. [S1] Ruth Bennett, Naudain Family of Delaware, above, p. 95 (naming James Naudain Conwell as his father). [S1] Ruth Bennett, Naudain Family of Delaware (Geneva, Neb. : n.pub., 1941), p. 94 (naming Myers Clark Conwell as her father). This material is a typescript of "notes" in Ms. Bennett's possession and apparently was originally written and compiled by James W. Lattomus. Copies are with the D.A.R. Library, Washington, D.C., and Roger Bartlett, Austin, Tex., and can be viewed at http://www.rabgenealogy.com/ui53.htm. The notes contain some inconsistencies, and page 45 was missing from the D.A.R. Library copy when it was copied. Marriage*: He married Hester Clark. [S1] Ruth Bennett, Naudain Family of Delaware (Geneva, Neb. : n.pub., 1941), p. 94 (naming Joseph C. Conwell as his father). This material is a typescript of "notes" in Ms. Bennett's possession and apparently was originally written and compiled by James W. Lattomus. Copies are with the D.A.R. Library, Washington, D.C., and Roger Bartlett, Austin, Tex., and can be viewed at http://www.rabgenealogy.com/ui53.htm. The notes contain some inconsistencies, and page 45 was missing from the D.A.R. Library copy when it was copied. Marriage*: She married Joseph C. Conwell. [S1] Ruth Bennett, Naudain Family of Delaware (Geneva, Neb. : n.pub., 1941), p. 94 (naming Hester Clark as his mother). This material is a typescript of "notes" in Ms. Bennett's possession and apparently was originally written and compiled by James W. Lattomus. Copies are with the D.A.R. Library, Washington, D.C., and Roger Bartlett, Austin, Tex., and can be viewed at http://www.rabgenealogy.com/ui53.htm. The notes contain some inconsistencies, and page 45 was missing from the D.A.R. Library copy when it was copied. [S1] Ruth Bennett, Naudain Family of Delaware (Geneva, Neb. : n.pub., 1941), p. 95 (naming James Naudain Conwell as his father). This material is a typescript of "notes" in Ms. Bennett's possession and apparently was originally written and compiled by James W. Lattomus. Copies are with the D.A.R. Library, Washington, D.C., and Roger Bartlett, Austin, Tex., and can be viewed at http://www.rabgenealogy.com/ui53.htm. The notes contain some inconsistencies, and page 45 was missing from the D.A.R. Library copy when it was copied. Other Names*: Elizabeth Cochran, Elizabeth Naudain Cochran Comegys, Eliza Cochran Comegys, Elizabeth Naudain Comegys, Elizabeth Comegys. [S1] Ruth Bennett, Naudain Family of Delaware (Geneva, Neb. : n.pub., 1941), p. 95 (naming Robert Alexander Cochran as her father). This material is a typescript of "notes" in Ms. Bennett's possession and apparently was originally written and compiled by James W. Lattomus. Copies are with the D.A.R. Library, Washington, D.C., and Roger Bartlett, Austin, Tex., and can be viewed at http://www.rabgenealogy.com/ui53.htm. The notes contain some inconsistencies, and page 45 was missing from the D.A.R. Library copy when it was copied. [S1441] Wilmington Morning News, Wilmington, Del., above, 24 Jul 1951, p. 4, col. 6 (obituary for Mrs. Elizabeth N. Comegys) (naming Lydia N. Cochran as her mother). [S961] Find A Grave, online at http://www.findagrave.com, memorial for Elizabeth Cochran Comegys, memorial no. 108529280, viewed on 23 Jan 2018 (giving the date but not the place). [S1441] Wilmington Morning News, Wilmington, Del., above, 24 Jul 1951, p. 4, col. 6 (obituary for Mrs. Elizabeth N. Comegys). [S1441] Wilmington Morning News, Wilmington, Del., above, 24 Jul 1951, p. 4, col. 6 (obituary for Mrs. Elizabeth N. Comegys) (not giving the date; stating that she was the widow of George Spencer Comegys). [S1441] Wilmington Morning News, Wilmington, Del., above, 24 Jul 1951, p. 4, col. 6 (obituary for Mrs. Elizabeth N. Comegys) (stating that she died that morning and had "been ill for some time"). [S961] Find A Grave, online, above, memorial for Elizabeth Cochran Comegys, memorial no. 108529280, viewed on 23 Jan 2018. [S1403] "Comegys Family," p. 3, typescript included in "Historical Society of Pennsylvania Family Collection, vol. 0111," at p. 114, online at http://www.familysearch.org, (naming Elizabeth Naudain Cochran as her mother). Obituary*: "DEATH OF SPENCER COMEGYS. [S1403] "Comegys Family," p. 3, typescript included in "Historical Society of Pennsylvania Family Collection, vol. 0111," at p. 114, online at http://www.familysearch.org, (naming Nathaniel W. Comegys as his father). [S1403] "Conegys Family," above (naming Helen Spencer as his mother). [S961] Find A Grave, online at http://www.findagrave.com, memorial for George Spencer Comegys, memorial no. 108529281, viewed on 23 Jan 2018. [S1] Ruth Bennett, Naudain Family of Delaware (Geneva, Neb. : n.pub., 1941), p. 95. This material is a typescript of "notes" in Ms. Bennett's possession and apparently was originally written and compiled by James W. Lattomus. Copies are with the D.A.R. Library, Washington, D.C., and Roger Bartlett, Austin, Tex., and can be viewed at http://www.rabgenealogy.com/ui53.htm. The notes contain some inconsistencies, and page 45 was missing from the D.A.R. Library copy when it was copied. [S1441] Wilmington Morning News, Wilmington, Del., online at http://www.newspapers.com, 24 Jul 1951, p. 4, col. 6 (obituary for Mrs. Elizabeth N. Comegys) (not giving the date; stating that she was the widow of George Spencer Comegys). [S961] Find A Grave, online, above, memorial for George Spencer Comegys, memorial no. 108529281, viewed on 23 Jan 2018 (giving the date but not the place). [S1337] The Evening Journal, Wilmington, Del., online at http://www.newspapers.com, 14 Nov 1916, p. 11, col. 6 (obituary for Spencer Comegys). [S1337] The Evening Journal, Wilmington, Del., above, 14 Nov 1916, p. 11, col. 6. [S1403] "Conegys Family," above (naming George Spencer Comegys as her father). Other Names*: Lydia Eddowes Cochran, Lydia Cochran. [S961] Find A Grave, online, above, memorial for Lydia Eddows Cochran, memorial no. 7753150, viewed on 20 Jul 2016 (naming Lydia E. Cochran as her mother). [S961] Find A Grave, online, above, memorial for Lydia Eddows Cochran, memorial no. 7753150, viewed on 20 Jul 2016. [S1337] The Evening Journal, Wilmington, Del., above, 7 May 1919, p. 7, col. 2 (obituary of Lydia Cochran). [S1337] The Evening Journal, Wilmington, Del., above, 7 May 1919, p. 7, col. 2. [S1] Ruth Bennett, Naudain Family of Delaware (Geneva, Neb. : n.pub., 1941), p. 95 (naming Robert Alexander Cochran as his father). This material is a typescript of "notes" in Ms. Bennett's possession and apparently was originally written and compiled by James W. Lattomus. Copies are with the D.A.R. Library, Washington, D.C., and Roger Bartlett, Austin, Tex., and can be viewed at http://www.rabgenealogy.com/ui53.htm. The notes contain some inconsistencies, and page 45 was missing from the D.A.R. Library copy when it was copied. Annie Naudain Cochran Crow's tombstone, Shrewsbury Cemetery, Kent County, Md. Photo by Stephen Keefe; used with his permission. 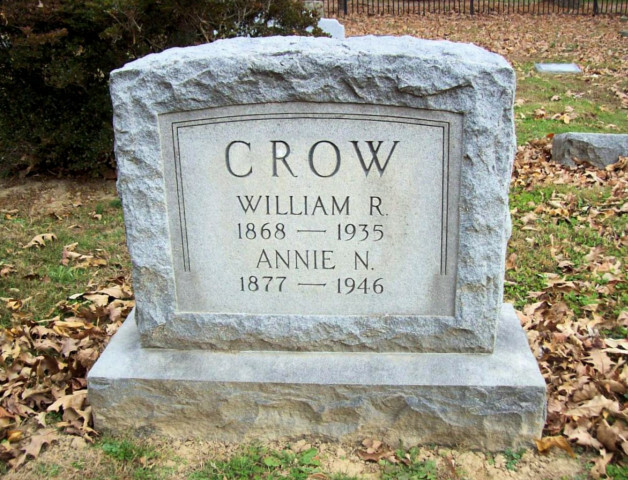 Other Names*: Anna Cochran, Anna Crow, Annie Cochran Crow, Annie Naudain Crow, Annie Nanderin Crow, Annie Crow. [S1448] Journal-Every Evening, Wilmington, Del., above, 17 Jul 1946, p. 16, col. 2 (obituary for Mrs. Annie N. Crow) (naming Lydia Naudain Cochran as her mother). [S1] Ruth Bennett, Naudain Family of Delaware, above, p. 95 (giving her name as Anna) (giving the date but not the place). [S961] Find A Grave, online at http://www.findagrave.com, memorial for Annie Naudain Cochran Crow, memorial no. 121410715 (giving the year and state). [S1] Ruth Bennett, Naudain Family of Delaware, above, p. 95 (giving her name as Anna). [S961] Find A Grave, online, above, memorial for Annie Naudain Cochran Crow, memorial no. 121410715 (not giving the date). [S961] Find A Grave, online, above, memorial for William Rankin Crow, memorial no. 121410678 (not giving the date). [S961] Find A Grave, online, above, memorial for Annie Naudain Cochran Crow, memorial no. 121410715. [S1448] Journal-Every Evening, Wilmington, Del., above, 17 Jul 1946, p. 16, col. 2 (obituary for Mrs. Annie N. Crow). [S961] Find A Grave, online, above, memorial for Elizabeth Crow Lusby, memorial no. 72496046, viewed on 7 Jul 2018 (naming Annie Naudain Cochran Crow as her mother). William Rankin Crow's tombstone, Shrewsbury Cemetery, Kent County, Md. Photo by Stephen Keefe; used with his permission. [S961] Find A Grave, online at http://www.findagrave.com, memorial for William Rankin Crow, memorial no. 121410678. [S1] Ruth Bennett, Naudain Family of Delaware (Geneva, Neb. : n.pub., 1941), p. 95 (giving her name as Anna). This material is a typescript of "notes" in Ms. Bennett's possession and apparently was originally written and compiled by James W. Lattomus. Copies are with the D.A.R. Library, Washington, D.C., and Roger Bartlett, Austin, Tex., and can be viewed at http://www.rabgenealogy.com/ui53.htm. The notes contain some inconsistencies, and page 45 was missing from the D.A.R. Library copy when it was copied. [S961] Find A Grave, online, above, memorial for Elizabeth Crow Lusby, memorial no. 72496046, viewed on 7 Jul 2018 (naming William Rankin Crow as her father). 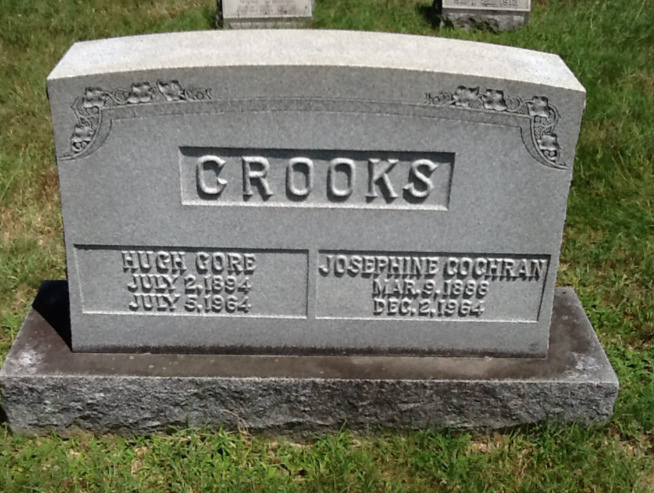 Tombstone for Josephine Cochran Crooks, Forest Presbyterian Church Cemetery, Middletown, Del., courtesy of James Ethridge. [S961] Find A Grave, online at http://www.findagrave.com, memorial for Josephine Cochran Crooks, memorial no. 134923265, viewed on 18 Jul 2018. [S1441] Wilmington Morning News, Wilmington, Del., online at http://www.newspapers.com, 4 Dec 1964, p. 15, cols. 3-4 (obituary for Mrs. Hugh G. Crooks). [S961] Find A Grave, online, above, memorial for Josephine Cochran Crooks, memorial no. 134923265, viewed on 18 Jul 2018 (giving the date but not the place). [S1441] Wilmington Morning News, Wilmington, Del., above, 4 Dec 1964, p. 15, cols. 3-4 (obituary for Mrs. Hugh G. Crooks) (stating that she died "after a long illness"). Tombstone for Hugh Gore Crooks, Forest Presbyterian Church Cemetery, Middletown, Del., courtesy of James Ethridge. [S961] Find A Grave, online at http://www.findagrave.com, memorial for Hugh Gore Crooks, memorial no. 134923179, viewed on 18 Jul 2018. [S1441] Wilmington Morning News, Wilmington, Del., online at http://www.newspapers.com, 7 Jul 1964, p. 26, col. 1 (death notice for Hugh G. Crooks) (stating that he died "suddenly"). [S1441] Wilmington Morning News, Wilmington, Del., above, 4 Dec 1964, p. 15, cols. 3-4 (obituary for Mrs. Hugh G. Crooks). [S1] Ruth Bennett, Naudain Family of Delaware (Geneva, Neb. : n.pub., 1941), pp. 95-96 (naming Edward Reynolds as her father). This material is a typescript of "notes" in Ms. Bennett's possession and apparently was originally written and compiled by James W. Lattomus. Copies are with the D.A.R. Library, Washington, D.C., and Roger Bartlett, Austin, Tex., and can be viewed at http://www.rabgenealogy.com/ui53.htm. The notes contain some inconsistencies, and page 45 was missing from the D.A.R. Library copy when it was copied. [S961] Find A Grave, online at http://www.findagrave.com, memorial for Edith Reynolds Barnard, memorial no. 35034850, viewed on 2 Sep 2013 (giving the year but no other date information). [S1] Ruth Bennett, Naudain Family of Delaware, above, p. 96 (spelling her name as Edith and giving the date but not the place). [S1278] Delaware Marriage Records, 1744-1912, online at http://tinyurl.com/m66juen, record for Edelh M. Reynolds, viewed on 2 Sep 2013 (indexed on ancestry.com as Edelh M. Reynolds but appearing to be spelled Edith on the original record). [S961] Find A Grave, online, above, memorial for Daniel Paddock Barnard, memorial no. 35034829, viewed on 2 Sep 2013 not giving the date or place). [S961] Find A Grave, online, above, memorial for Edith Reynolds Barnard, memorial no. 35034850, viewed on 2 Sep 2013 (not giving the date or place). [S961] Find A Grave, online, above, memorial for Edith Reynolds Barnard, memorial no. 35034850, viewed on 2 Sep 2013. [S961] Find A Grave, online at http://www.findagrave.com, memorial for Daniel Paddock Barnard, memorial no. 35034829, viewed on 2 Sep 2013. [S1] Ruth Bennett, Naudain Family of Delaware (Geneva, Neb. : n.pub., 1941), p. 96 (spelling her name as Edith and giving the date but not the place). This material is a typescript of "notes" in Ms. Bennett's possession and apparently was originally written and compiled by James W. Lattomus. Copies are with the D.A.R. Library, Washington, D.C., and Roger Bartlett, Austin, Tex., and can be viewed at http://www.rabgenealogy.com/ui53.htm. The notes contain some inconsistencies, and page 45 was missing from the D.A.R. Library copy when it was copied. [S1] Ruth Bennett, Naudain Family of Delaware (Geneva, Neb. : n.pub., 1941), pp. 95-96 (naming Edward Reynolds as his father). This material is a typescript of "notes" in Ms. Bennett's possession and apparently was originally written and compiled by James W. Lattomus. Copies are with the D.A.R. Library, Washington, D.C., and Roger Bartlett, Austin, Tex., and can be viewed at http://www.rabgenealogy.com/ui53.htm. The notes contain some inconsistencies, and page 45 was missing from the D.A.R. Library copy when it was copied. [S1] Ruth Bennett, Naudain Family of Delaware (Geneva, Neb. : n.pub., 1941), p. 96. This material is a typescript of "notes" in Ms. Bennett's possession and apparently was originally written and compiled by James W. Lattomus. Copies are with the D.A.R. Library, Washington, D.C., and Roger Bartlett, Austin, Tex., and can be viewed at http://www.rabgenealogy.com/ui53.htm. The notes contain some inconsistencies, and page 45 was missing from the D.A.R. Library copy when it was copied. Family: Malcolm Strange Councill M.D. [S1] Ruth Bennett, Naudain Family of Delaware (Geneva, Neb. : n.pub., 1941), p. 96 (naming Edward Louis Duer, M.D. as her father). This material is a typescript of "notes" in Ms. Bennett's possession and apparently was originally written and compiled by James W. Lattomus. Copies are with the D.A.R. Library, Washington, D.C., and Roger Bartlett, Austin, Tex., and can be viewed at http://www.rabgenealogy.com/ui53.htm. The notes contain some inconsistencies, and page 45 was missing from the D.A.R. Library copy when it was copied. Note*: He was from Virginia. Other Names*: Louise Naudain Corbit Duer, Louise Corbit Duer, Louise Naudain Duer, Louise Duer. "PHILADELPHIA, Aug. 27 —Dr. Edward L. Duer, of 1606 Locust street, although seventy-two years of age and a widower for 27 years, had become engaged to marry Miss Louise Corbit, daughter of Daniel W. Corbit, a niece of ex-United States Senator Higgins and a member of a prominent Delaware family residing at Odessa. Her age is half the doctor’s. "Dr. Duer and Miss Corbit became engaged last spring and the news, kept a secret since then by a few of their most intimate friends, has just transpired. "Dr. Duer’s son and daughter were enthusiastic advocates of the match. The son, Dr. Naudain Duer, is 40, about six years older than his future stepmother. "Doctor Duer, Sr., is residing during the summer at Bryn Mawr with his daughter, Mrs. Councill, the wife of Dr. Malcolm Councill. He is a “gentleman of the old school,” and carries his age so remarkably well that he looks scarcely more than 50. He has known Miss Corbit since she was a baby, and has always been on most intimate terms with her parents. His first wife, who was Miss Naudain, was a first cousin of Miss Corbit’s mother and a second cousin of Miss Corbit’s father. "Miss Corbit’s father is one of the managers of the New Castle County Workhouse, below Wilmington, and a trustee of Delaware College, at Newark. "Miss Corbit’s mother was a sister of ex-Senator Higgins. An uncle, John C. Higgins, is United States Consul at Dundee, Scotland. Governor Lea, of Delaware, and Judge Spruance, of Wilmington, are relatives of Miss Corbit, who is also a descendant of Dr. Arnold Naudain, a State Senator of Delaware. "Miss Corbit was educated by governesses and at Miss Richmond’s private school in Walnut lane, Germantown. She is literary, artistic and domestic in her tastes. She is one of two children, her sister being Mrs. Frederick William Curtis, of Newark, Del. "After the death of Dr. Duer’s first wife, his two children lived for a time at Miss Corbit’s home at Odessa, under the care of her mother, the three children being taught there by the same governess. "The marriage will take place at Odessa, probably on October 3. [S1] Ruth Bennett, Naudain Family of Delaware (Geneva, Neb. : n.pub., 1941), p. 96 (naming Daniel W. Corbit as her father). This material is a typescript of "notes" in Ms. Bennett's possession and apparently was originally written and compiled by James W. Lattomus. Copies are with the D.A.R. Library, Washington, D.C., and Roger Bartlett, Austin, Tex., and can be viewed at http://www.rabgenealogy.com/ui53.htm. The notes contain some inconsistencies, and page 45 was missing from the D.A.R. Library copy when it was copied. [S961] Find A Grave, online at http://www.findagrave.com, memorial for Louise Naudain Corbit Duer, memorial no. 10043543, viewed on 4 Jul 2016. [S1] Ruth Bennett, Naudain Family of Delaware, above, p. 96 (misstating the date as 1807). [S961] Find A Grave, online, above, memorial for Louise Naudain Corbit Duer, memorial no. 10043543, viewed on 4 Jul 2016 (not giving the date or place). [S961] Find A Grave, online, above, memorial for Dr. Edward Louis Duer, memorial no. 10043545, viewed on 4 Jul 2016 (not giving the date or place). [S1441] Wilmington Morning News, Wilmington, Del., online at http://www.newspapers.com, 17 Jun 1941, p. 24, col. 2 (obituary of Mrs. Edward L. Duer). [S961] Find A Grave, online, above, memorial for Louise Naudain Corbit Duer, memorial no. 10043543, viewed on 4 Jul 2016 (giving the date but not the place). [S1337] The Evening Journal, Wilmington, Del., online at http://www.newspapers.com, 27 Aug 1907, p. 8, col. 2. [S1441] Wilmington Morning News, Wilmington, Del., above, 17 Jun 1941, p. 24, col. 2. [S1] Ruth Bennett, Naudain Family of Delaware, above, p. 96 (naming Daniel W. Corbit as her father). [S1] Ruth Bennett, Naudain Family of Delaware (Geneva, Neb. : n.pub., 1941), p. 96 (naming James M. Todd as his father). This material is a typescript of "notes" in Ms. Bennett's possession and apparently was originally written and compiled by James W. Lattomus. Copies are with the D.A.R. Library, Washington, D.C., and Roger Bartlett, Austin, Tex., and can be viewed at http://www.rabgenealogy.com/ui53.htm. The notes contain some inconsistencies, and page 45 was missing from the D.A.R. Library copy when it was copied. [S1405] J. R. Witcraft, comp., Todds of the Eastern Shore Maryland (Philadelphia, Pa.: Dispatch Publishing House, 1912), online at http://www.familysearch.org, p. 20 (giving his name as James Naudain Todd, Jr. and naming James Nathan Todd as his father). [S1] Ruth Bennett, Naudain Family of Delaware, above, p. 96 (naming Clara Naudain as his mother). [S1405] Todds of the Eastern Shore Maryland, above, p. 20 (giving his name as James Naudain Todd, Jr. and naming Clara Naudain as his mother). [S1] Ruth Bennett, Naudain Family of Delaware (Geneva, Neb. : n.pub., 1941), p. 97 (naming Alfred Howard Naudain as her father). This material is a typescript of "notes" in Ms. Bennett's possession and apparently was originally written and compiled by James W. Lattomus. Copies are with the D.A.R. Library, Washington, D.C., and Roger Bartlett, Austin, Tex., and can be viewed at http://www.rabgenealogy.com/ui53.htm. The notes contain some inconsistencies, and page 45 was missing from the D.A.R. Library copy when it was copied. [S1] Ruth Bennett, Naudain Family of Delaware, above, p. 97 (naming Mary E. Stevenson as her mother). [S1] Ruth Bennett, Naudain Family of Delaware, above, p. 97. [S1] Ruth Bennett, Naudain Family of Delaware (Geneva, Neb. : n.pub., 1941), p. 97 (naming Alfred Howard Naudain as his father). This material is a typescript of "notes" in Ms. Bennett's possession and apparently was originally written and compiled by James W. Lattomus. Copies are with the D.A.R. Library, Washington, D.C., and Roger Bartlett, Austin, Tex., and can be viewed at http://www.rabgenealogy.com/ui53.htm. The notes contain some inconsistencies, and page 45 was missing from the D.A.R. Library copy when it was copied. [S1] Ruth Bennett, Naudain Family of Delaware, above, p. 97 (naming Mary E. Stevenson as his mother).